Santa Claus came early this year and brought me an iPod Nano 8GB (6th generation). Yes, it’s the multi-touch and it’s also in orange. I’m actually so excited about it that I haven’t connected it to my iTunes and wanted to write this post. When this model was first released, people started making remarks to turn it into a watch. 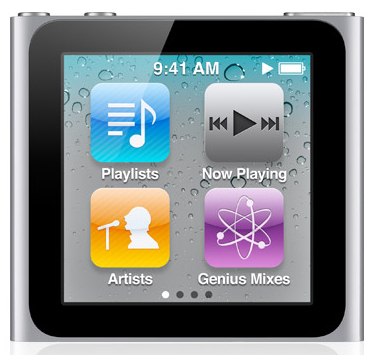 Sure enough manufacturers started making watch bands that can hold the iPod Nano. I’ve taken a look a few of these bands and I’m not thoroughly impressed. Other than the HEX Nano watch band, the rest are bracelets where you clip on the Nano. I tried to make my own. First, I tried to use a previous leather bracelet of mine but the current holes didn’t line up. Fail. 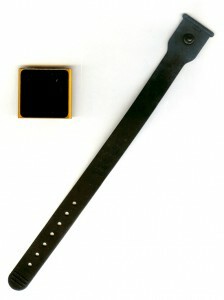 Then, I tried fashioning a bracelet from a belt. Apparently, I don’t have enough tools to handle leather. Fail. Finally, I was searching on the web for a solution, looked down and looked at my power adapter. My power adapter had a rubber strip for cable management. Success! I clipped on the Nano to the band, wrapped it around my wrist and “Tada!” Now I have a Nano Watch. I’m curious to know what you’ve done. Emails and comments are welcome.